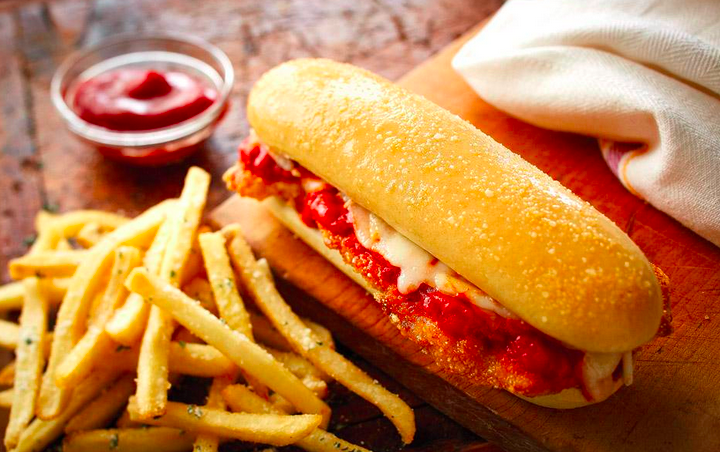 Would You Eat A Chicken Parmesan Breadstick Sandwich From Olive Garden? More new menu items for the OG? Image courtesy of Olive Garden unveiled its new breadstick sandwich on Twitter. Olive Garden unveiled its new breadstick sandwich on Twitter. Olive Garden has never been shy when it comes to experimenting with new menu items. Remember when the company introduced burgers and tapas? Apparently the scientists in the OG kitchen haven’t hung up their goggles just yet, with the restaurant now set to test breadstick sandwiches. That’s right, the company’s new board members – who famously dissed the restaurant’s over-zealous dishing out of breadsticks just a few months ago – are embracing the idea of using those well-known sticks as sandwich bread, Business Insider reports. News of the experiment, which includes chicken parmesan on a breadstick, was revealed when Starboard Value CEO Jeff Smith made an appearance on Wall Street Week on Sunday. “We’re going to use that great brand equity and we’re about to come out with breadsticks sandwiches,” Smith said of America’s love affair with the restaurant’s garlic- and butter-coated breadsticks. Olive Garden officially announced the new sandwiches – along with a professionally staged photo of the new item – in Twitter post Monday morning. When Smith was asked about his feelings toward the restaurant’s free breadsticks, he made it clear he actually loves the iconic item. Smith also reiterated that the investor’s 300-page proposal outlining a plan to turn around the Italian chain – which criticized the restaurant’s management – was about addressing policy infractions. “They are supposed to give out breadsticks equal to the number of people at the table plus one, so they stay warm, they had lost that discipline,” Smith says. Smith didn’t elaborate on how the new Starboard-led company has worked to turn around the breadstick policy or what exactly the new sandwiches would look like. All we can picture is a skinny piece of bread with a skinny strip of chicken parmesan.